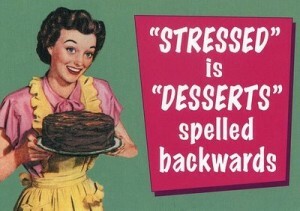 Stress eating is quite possibly the number one issue people have to contend with when trying to lose fat. The common message out there is to just get through it, be strong, have willpower. But there’s no strategy offered, no how or why, and one directive to every person in society isn’t the way to approach this. You need options and strategies to handle these moments beyond “just do it.” Then once you know, it’s on you to decide to use them, or not. Last week I received an email from a client who has lost a lot of weight but is now struggling in maintenance with stress and emotional eating. Stress comes and goes and it’s not uncommon for this to happen, even if you’ve been successful with fat loss before and even if you’re working with a professional. “I have a serious question for you about emotional eating. Is it possible to overcome junk food stress/emotional eating? Is it something we can manage? Yes, it’s possible to overcome junk food stress/emotional eating. When you eat junk food (or anything!) due to stress what you’re really looking for is to feel better; to have a good feeling replace the crappy feeling. The problem is that eating junk as an escape mechanism doesn’t work. It NEVER works. What you have to do is learn to sit with the emotion when it becomes uncomfortable. You have to force yourself to feel the bad feelings, acknowledge them and sit with them without acting out (eating). Here’s an analogy – you reach into your freezer and grab an ice cube and hold onto it with a tight grip. When you hold onto that ice cube it’s going to feel very uncomfortable. You’re going to want to drop the ice cube because it’s too cold to hold onto. But the longer you hold onto it, the ice cube will eventually melt and as it does, the uncomfortable cold and the need to act (dropping the ice cube) subsides. Eventually the intensity of that emotion will lessen (just as the ice cube melted) and with it, the intensity of the need to relieve that emotion with food will follow. This practice will help you shift to a new type of thought or action instead of eating because you’ll recognize that eating your emotions doesn’t work and that it will never work. The more you practice, the easier it becomes. But it does take a lot of diligent practice. This strategy was inspired by one of my current clients who has used this technique with success. It may not work for everyone, but I want you to give it a try. You can even just get started by setting a timer for 10 minutes or by taking an ice cube out of your freezer and holding it until it melts. Just sit with those uncomfortable feelings for that short time, and reassess the urge to eat on a scale of 1-10 once the time has passed. Is it as intense? How much did it decrease? How much more might it decrease with another 5 minutes? Keep practicing every time it happens. Lastly, I need your help. As I said, this approach may not work for everyone, so I want to hear from anyone struggling with this same issue or who has been successful with it. What have you found that works for you? Post it here and let’s get as many suggestions as possible. Let’s stop being held hostage to emotional eating and arm ourselves with the tools to learn to stop. You never know, something you read or share may end up being just the “Aha!” you or someone else needs to conquer this once and for all. 10 Comments to "Overcome Stress Eating"
Take a walk or do something active for 10 minutes. Distract yourself from the desire to eat. I think distraction is a reasonable option for the short term, but we’re kidding ourselves if we think we can avoid real emotion or feeling for any real length of time. We’re so conditioned to believe feeling of any kind is a terrible thing, expressing ourselves is bad, we “should” just be even keeled and go with the flow, not ruffle feathers….We go so long without allowing those feelings out, that when they are finally surface they feel *overwhelming! * so it’s understandable we want them to go away. But I really believe giving yourself permission to just be and feel can be insanely free-ing and can actually keep some of that (*some*) overwhelming intensity from building and eventually, make these moments easier to handle. Something also to look at is this. Stress changes our body chemistry which affects mood or cravings, so stress management and emotional eating have an emotional and physiological component. Our stress effects our bodies, our bodies effect how we handle stress and round and round we go. You are right that stress eating is a temporary fix and will not dissolve the stress but make it worse. Good one, Rashmi. Yes having that plan is key. When we just wing it we’re tempting fate. Cathy, that is so awesomely said. You nailed it. Good stuff. K – 100 percent true and a very good point. Stress has both the emotional and physiological component and yes round and round we go. Having a backup plan or two also helps. Don’t wait for high stress times to hit before deciding you need a Plan B. Have Plan B already available so that it’s the easiest option to pursue and won’t leave you feeling bad for making poor choices. Also, start a scrapbook or journal of motivating quotes and articles, resources that help you to move past your isolated self and get a better perspective on life. When I’m wrapped up in misery, it’s all about me, but a wider perspective helps me to see, again, that I’m not alone on this journey, my struggle is not unique and, like others, I can and will find my way out of the morass if I don’t give up or give in. Thanks for the great tips, Marcia!